It was a low-scoring first day in the last round of Ranji Trophy matches, as several teams prepared result-oriented wickets in search of victories that could take them through to the quarter-finals. Twelve wickets fell in the crucial game between top-side Mumbai and third-placed Delhi on a pitch that was offering the seamers some assistance at the Roshanara Club Ground in Delhi. The hosts hold a slight edge after dismissing Mumbai for 267 after they had elected to bat. Delhi lost some of the advantage when they came out to bat, with seamer Ajit Agarkar striking two blows for Mumbai to leave Delhi at 47 for 2. Virat Kohli, who missed the last three of Delhi's games because he was playing for India against New Zealand, was bowled by one that kept low from Agarkar and at that stage Delhi were 28 for 2. Shikhar Dhawan and captain Mithun Manhas were unbeaten at stumps. Delhi need a win to ensure qualification for the next round, while three points will give them a chance, provided other results go their way. Seamers Sumit Narwal, who took nine wickets in Delhi's last match against Railways, and Pradeep Sangwan, did the damage for the hosts, taking four wickets each. Narwal got the first breakthrough, bowling Mumbai wicketkeeper Onkar Gurav in the third over of the match. Later, Narwal credited Manoj Prabhakar and Sanjeev Sharma for fine-tuning his bowling. "They have been talking to all of us how to read the batsmen, how to analyse a game, passing off their knowledge and helping us with our technique at the same time," Narwal told Indian Express. Seamer Parvinder Awana chipped in with a couple of wickets to reduce Mumbai to 47 for 3. Captain Wasim Jaffer and Rohit Sharma both got starts in the middle-order, but Suryakumar Yadav was the only Mumbai batsman to reach a half-century. His 73 off 89 balls and some useful runs from Agarkar and left-arm spinner Iqbal Abdulla were the reasons Mumbai managed to go past 250. Yadav, however, was disappointed not to reach his hundred. "It is disappointing to get out when you are almost close to the three figure mark," Yadav said. "I was trying to guide the ball for a single but it ballooned into the hands of Kohli. I would have been happier if I had got a hundred on debut." Bengal only managed 201 in their first innings against Railways at the Karnail Singh Stadium in Delhi, but it may turn out to be a decent score given that the wicket was already behaving unpredictably on the first day. Both teams knew the wicket was going to turn and keep low, so it was no surprise that Bengal elected to bat first. 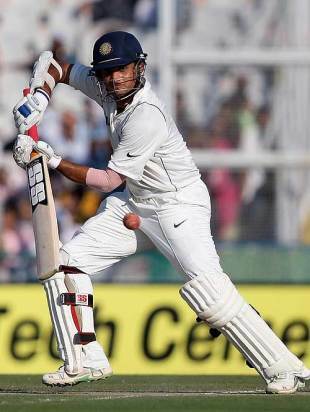 Sourav Ganguly, the former India captain, was playing his first Ranji Trophy match of the season, and he came in at a crucial juncture with Bengal at 109 for 3. He looked uncomfortable, barely moving his feet during the 43 minutes he spent at the wicket, and eventually inside-edged one that kept low from seamer Anureet Singh onto his stumps. While Railways spinners managed to get some assistance from the wicket, it was poor shot selection that was the main cause of Bengal's low total. Captain Manoj Tiwary got his eye in and was looking comfortable on 42 when he tried to smash left-arm spinner Nileshkumar Chauhan down the ground, against the spin. He ended up holing out to mid-on to leave Bengal at 160 for 6. It was a similar story for opener Aridnam Das, who was set on 21 when he was caught at short fine leg attempting a slog sweep off left-arm spinner Murali Kartik. Wicketkeeper Gitimoy Basu was the only batsman to build on a start, reaching 58. Kartik ended up with two wickets for Railways while Anureet took three. Bengal will hope the pitch deteriorates further as the match goes on, since Railways will have to bat last. Both sides still have a chance of making the quarter-finals, and are separated by just one point in a very tight Group A table. The Chennai weather continued to be the biggest obstacle to Tamil Nadu's passage to the next phase. They have already had three rain-affected matches at the MA Chidambaram Stadium of which two did not see the first-innings completed. Only 42 overs could be bowled on the first day in their crunch match against Gujarat. On a wicket that, like many others in the last round, took turn from the first day itself, Gujarat crawled to 69 for 4, scoring at 1.64 runs per over. The hosts would be happy with their position but will be nervous about further rain stoppages in the next three days. If they do not manage to finish an innings in the match, it will give Delhi, Bengal and Railways all a chance to pass them in the table and go through to the quarter-finals. Gujarat's batsmen struggled against the offspin duo of R Ashwin and Suresh Kumar, who took three wickets between them. Ashwin took the vital wicket of Parthiv Patel, luring him to drive straight to Ganapathy at cover. S Badrinath did his bit on the field by taking a sharp diving catch at first slip to remove Bhavik Thaker off Suresh Kumar. Niraj Patel managed to stay unbeaten at stumps, after his 26 had taken 109 balls. Seventeen wickets fell on the first day of the match between Saurashtra and Assam at the Khandheri Cricket Stadium in Rajkot. Assam needed an innings victory to give themselves an outside chance of making it to the top three spots, but ruled out that possibility after collapsing to 107 for 7 in response to Assam's 140. That makes this match all about who will be relegated to the Plate League next season. After electing to bat, Saurashtra lost their last eight wickets for 48 runs, with five of their last seven batsmen failing to get to double figures. Shitanshu Kotak's 44 was their highest score. The wickets were shared amongst the Assam bowlers, with Tarjinder Singh taking three, offspinners Arlen Konwar and Sarupam Purkayastha taking two each, while fast bowler Abu Nechim also got two. Left-arm spinner Ravindra Jadeja derailed Assam's reply early, taking three wickets and leaving Assam at 33 for 4. Offspinner Kamlesh Makvana then got in on the act, taking three scalps within a few overs and leaving Assam at 76 for 7. Purkayastha and Nechim managed to survive till stumps, and their unbeaten 31-run stand for the eight wicket was actually Assam's highest partnership. Baroda have all but booked their place in the quarter-finals after taking the first-innings lead against bottom-of-the-table Himachal Pradesh at the Moti Bagh Stadium in Vadodara. Left-arm spinner Bhargav Bhatt did most of the damage, snaring four of the first five batsmen to fall, as HP were dismissed for 119. At 78 for 8, it looked like HP might not even get to a century, but No.10 Gurvinder Singh made 25, and added 40 with Varun Sharma, to push them past the three-figure mark. The 20-year-old Bhatt finished with 5 for 40, while India seamer Munaf Patel backed him up with 3 for 30. Bhat is now the top wicket-taker this Ranji season, having taken 28 wickets, including two five-wicket hauls. "When I got the five-wicket haul against Haryana, it boosted my confidence," Bhat told Times of India. "I keep my cool while bowling and never get intimidated by the reputation of a batsman." Baroda lost three early wickets, including the dangerous Yusuf Pathan, with just 13 on the board, before Kedar Devdhar and Ambati Rayudu steadied the innings with a 108-run partnership. Vikramjeet Malik had Rayudu caught behind for quick 57, made from 72 balls with seven fours and a six, but Pinal Shah helped Devdhar, who was unbeaten on 71, take the hosts to 173 for 5. Haryana bowled Orissa out for 175 to keep alive their slim hopes of going through to the quarter-finals. India legspinner Amit Mishra and Sachin Rana each took three wickets at the Bansi Lal Cricket Stadium in Rohtak, with Subhrajit Sahoo the only batsman to go past 25, making an unbeaten 50 from 102 balls. Haryana got off to a decent start, with the openers putting together 30 before Nitin Saini was caught off medium-pacer Alok Sahoo for 14. That triggered a mini-collapse, with Sahoo taking two more wickets, and Debasis Mohanty bowling Ankit Rawat for 1, to leave the hosts 43 for 4. Former India batsman Hemang Bedani and Rana then took them to 75 at the close of play. Uttar Pradesh needs a win over table-toppers Karnataka to make sure they stay alive in the tournament, although a first-innings lead could see them through as well, depending on other results, and legspinner Piyush Chawla has given them the edge on the first day at Green Park in Kanpur, taking 4 for 74, to restrict Karnataka to 274 for 7. The visitor's total was build around two partnerships: Manish Pandey and Amit Verma put on 102 for the third wicket after Karnataka found themselves in a bit of bother at 28 for 3, and Pandey was adjudged lbw - a decision that didn't go too well in the Karnataka camp as they felt that the ball was going down leg - when he missed a sweep shot against Chawla. Karnataka recovered, courtesy Muralidharan Gautam and Vinay Kumar who added 91 for the seventh wicket. Verma made 54, Kumar 51 and Pandey 36, with all three falling to Chawla. Gautam was still there on 62, with former India left-arm spinner Sunil Joshi on 13 for company.